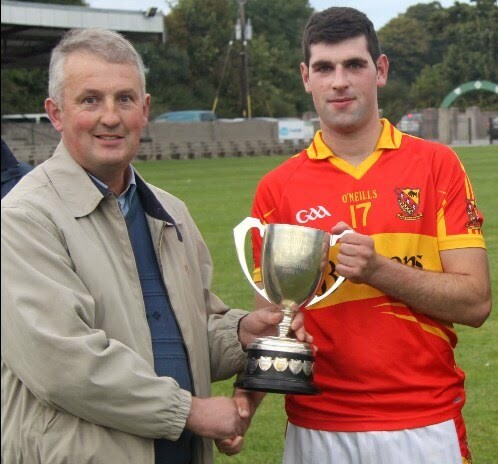 A hugely impressive Moycarkey-Borris powered their way to victory in the Roskeen Construction Mid junior A hurling final at Holycross on Saturday, being in no way flattered by their eight points winning margin over holders, Loughmore-Castleiney. From start to finish Moycarkey-Borris were the masters and on the evidence of this showing they have the credentials to add the county crown to their divisional honours. They set their stall out early, going 1-4 to no score clear inside ten minutes. Even if Willie Dempsey’s goal off a long range free in the 4th minute, which appeared to go all the way to the net with backs and forwards striving to make contact with it, was a bit fortuitous, the signs were there that Moycarkey were ”up” for the contest and playing with verve and confidence. Veteran Seamie Bohan had Loughmore’s first score, a point in the 11th minute but it did not stop the Moycarkey onslaught and by the interval they were 1-8 to 0-4 clear, albeit playing with the fresh breeze. Moycarkey looked winners at that stage thanks to the excellence of Pat Molloy and Gary O Connell at halfback, the strength of midfielders Paudie Doran and Ger Carey, and an extremely lively attack in which corner men Cathal Ryan and Rory O Regan always threatened scores. An embattled Loughmore would have been worse off were it not for the heroics in defence of Henry Maher, in particular, Gary Sweeney and Joseph Hennessy. Their attack was making little headway with Seamie Bohan the only one to pose a threat, though Shane Hennessy was also putting in a solid shift. Still, with the breeze to aid them in the second half, Loughmore-Castleiney were not without hope but in the third quarter, Moycarkey-Borris were every bit as dominant as before. Robert Clancy’s goal in the 13th minute put them 2-12 to 0-7 clear and the game was beyond redemption for Loughmore-Castleiney. True to tradition, Loughmore never gave up. They enjoyed a decent last quarter, Seamie Bohan’s goal in the 56th minute leaving them only seven points adrift. He pointed again immediately afterwards but time was against them now, and it was Moycarkey who had the last say with points from Robert Clancy and Willie Dempsey setting the seal on a victory richly deserved and enthusiastically welcomed by their supporters. This is an excellent Moycarkey combination, one that will take stopping in the race for county honours. They defend well, use the ball intelligently, and as their tally indicates, they know where the posts are, even allowing for some slack shooting at times. They had team captain Gerry McGuire back after injury to bolster their halfback line and with impressive showings against Sarsfields in the semi-final and now Loughmore, their confidence will be very high facing into the county quarter-finals. Apart from those already mentioned, Willie Dempsey and Robert Clancy were others to contribute handsomely to the success while sub, Michael Roche did well when he came on. Loughmore-Castleiney never go under softly and neither did they here, but they simply were not good enough. They had previously lost to Moycarkey in the league section of the competition so they knew before throw-in they would be up against it. They have the consolation of a county quarter-final to keep their year going but the loss of key players to the club’s senior side have taken their toll. Apart from those already mentioned, Joseph Hennessy, goalie Craig Cleary, Joe Nyland, Paddy Moynihan and David McGrath tried hard.